These gifts are given in memory of or to honor a person(s) who have played a vital role in the donor's life or in the life of a community. These gifts can be made in a variety of forms. For details about all the ways you can make a donation, please click here. Partner's of Hope is our monthly donation program. As a monthly donor you will be using the easiest, safest and most secure way to show your support for Goodwill’s mission and activities. Automatic monthly donations via credit card or direct debit from your checking account mean less paper and administration work. To join Goodwill's Partners of Hope or to print out a contribution form, click here. To learn more about making a planned gift, or to learn about the variety of options available to suit your philanthropic goals, please click here. “There are so many options for a donor. What attracted me to Goodwill is your philosophy of a hand up, not a hand out. Training people to be self-sufficient is especially appealing to me and a good investment," Ann, planned gift donor. 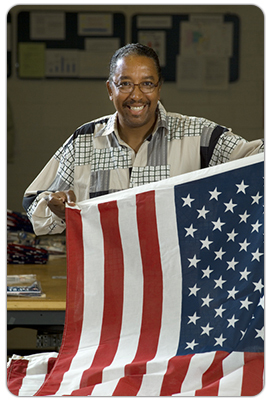 These gifts allow Goodwill to use the funds where there is the most need for programs and services. Please contact Katie Mattson at (414) 847-1597 or email at katie.mattson@goodwillsew.com or Brigette Sahlstrom at 414-847-4173 or email at Brigette.Sahlstrom@goodwillsew.com.